Every summer Hollywood dazzles us with big budget movies, and along with these big releases come ever-increasing amounts of movie merchandising. And while some deplore this, we as a society apparently love it. We eat it up. Ours is a society oriented around Valuable Collector's Items and the Next Big Thing. Merchandising has become so ingrained in our culture that it's a topic for self parody. In Disney's Hercules, the hero attempts to prove his worth by pointing out that he has an action figure. And was he ever an action figure, appearing in numerous forms as toys, not to mention T-shirts, hats, tote bags, coffee mugs, statuettes, beach towels and all that other stuff that sports the merchandisable characters in today's mainstream entertainment, characters which, more often that not, appear to have been designed with that merchandising firmly in mind. Not that any of this bothers me, really. In fact, as I write this I have a little Megara figure perched up on my computer. I love those Disney heroines, and the wonderfully long hair they've been sporting ever since the Little Mermaid revived the studio. No, I don't mind merchandising. What bothers me is lame merchandising. For many years, I've felt that They (whoever They are) just don't get it. These people who decide what to make into merchandise. They're idiots. I've felt this way ever since I was a kid. It was those stupid store bought Halloween costumes that first irritated me. If I want to be Superman for Halloween, I want to wear what Superman wears. Don't give me a jumpsuit with a picture of Superman flying by and the word "Superman!" emblazoned across the chest. That's not how Superman dresses... so why do They make Superman "costumes" that way? I suppose it's because the people who make these products are more concerned with making sure the franchise is advertised than with making a product that's really cool. Which is why, when it comes to merchandising, I'm almost always disappointed. Why do we buy licensed products, anyway? It seems rather odd, doesn't it? That we should voluntarily rent out space on our bodies as billboards to items of popular culture? But it's part of who we are, at least in 90's western culture. With the dizzying array of entertainment choices we all have, who we are is defined to large degree by what we like, and expressing our preferences visually about our person seems to be an innate human desire. If it weren't, licensed merchandise wouldn't be the multi-billion dollar industry that it is. I just wish licensed products could be a little more subtle. Like the crappy Superman costume, They always find it necessary to put the name of the show or movie or whatever in giant logo form on the product, just to make sure everyone knows what the product really is. Licensed products never have any style. The thing They just don't understand is why we, as a society, want licensed merchandise. Movies are escapism, a chance to pretend for a couple of hours that you are someone else, someone whose life is much more exciting than your own. Movies we like a lot we remember and think about, and the memory of the film starts to blur with memories of real life and the escapism continues. And so, we buy merchandise, not because we wish to be billboards, but because we want souvenirs. And from that standpoint, the coolest souvenirs are the ones that we really brought back from the experience, not something that is an advertisement for that experience. The thing you want when you finish reading the Lord of the Rings is a replica of the One Ring to carry on a chain, not a "Frodo Lives" T-shirt. The reason I bring all this up is The Truman Show. If you haven't seen it yet, get away from the computer, go to a movie theater, and see it. It's great. 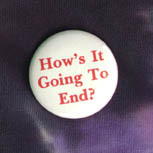 Those of you still with me will recall that during one of my favorite scenes in the film, a central character wears a lapel pin that says simply, "How's it Going to End?" It was immediately obvious to me that this was the product that should be made available: buttons like the one this character wears. Fans of the movie could wear them as a statement without looking like a walking advertisement. But what are we offered instead? I went to their website to see if, by some chance, someone in their product design department had a clue. Nope, all they've got are baseball caps that say "The Truman Show" and T-shirts with the words "Cue the Sun" (a typically lame choice if you asked me). Luckily, since we have a color printer and a small button maker in our lab, I was able to make the button I wanted for myself. So I did. And I started wearing it around, and of course, Kristin and Lori wanted buttons too, and so did Gina and John, and today Keith asked me for one, and I figured, well, if They aren't going to do it, why not sell them ourselves? So, we made a bunch and sold 'em through our website. They've been gone for awhile but hopefully they'll be availlable again soon. Watch our online store's full index if you want one. I should say, in closing, that They aren't all clueless. I got a mailing not long ago from the J. Peterman company (for you Seinfeld fans out there, yes, it's a real company) offering up a replica of the Heart of the Ocean as depicted in Titanic. (Now there's a souvenir.) And there are some great lines of toys out these days that are high-functionality replicas of things like light sabers, communicators, and tricorders, toys we'd have killed for back in the good old days when those shows and films were new. And I noticed that a recent line of Men In Black toys at Burger King included a standard issue Neuralizer. So perhaps They are learning. But there's still plenty of room for improvement.